Many people who have sponsored books asked me to let them know when I have another book sponsorship open. They sincerely want to help me. Between the black pit masquerading as my inbox and my unease with daring to take money for books that I haven’t yet written, however, I can’t actually accomplish that. I have elected to outsource yet another job that I’m no good at. In addition to my fiction announcement and nonfiction book announcement lists, I have a sponsorship announcement list. You’ll only get mail when I open a sponsorship. Part of having an annual goal is accountability, so: how did January go? I wrote 27,500 words, or a little over half my goal. Given that I wrote 14,100 words in November 2018, doing my best to write full-out: I’ll take it. Also, a big chunk of this was redrafting parts of the jails book. I don’t count rewritten words. I only count words that make the manuscript longer. If a book is at, say, 30,000 words, and I discard 5,000 of them and rewrite them in a day, how many words did I write? Well, if the book is 30,000 words at the end of the day, then I wrote… zero words. I am not paid to rewrite. I am paid to produce quality books. Left to my own devices, I’ll fiddle with text until it’s absolutely perfect. Long obsolete, but perfect. The good news is, the jails books nears completion. I have to write about RCTL, figure out my last problems with delegating ZFS datasets to a jail, and a couple tidbits about iocage migration. Once I finish the first draft of the book, the print and ebook sponsorships close. I’m drawing the tech reviewers for this book from the FreeBSD developers. I always give them first dibs, mind you, but the response this time was overwhelming. Seems a whole bunch of developers want this book to exist. Which is really cool! But it does mean that I have all the tech reviewers I can handle right now. With any luck I’ll have FMJ for BSDCan. Perhaps even Penguicon, if everything goes really well. As the tech reviewers and copyeditors do their work on FMJ, I’ll finish up Terrapin Sky Tango (Beaks #2) and get my lab set up for a second edition of the sudo book. After pounding my head on the bars of the jail for almost a year, I can really use a comparatively easy book. I’ll leave you with the draft cover for FreeBSD Mastery: Jails. In addition to the nifty back cover quote from PHK, I also asked him to write a foreword. He was gracious enough to indulge me. I set some ambitious goals for 2018. How did I do? There’s a few reasons why. A relative fell off a roof and suffered a traumatic brain injury. I’m the family member that won’t get fired for not showing up to work, so I handled a bunch of it. There’s something about arguing with hospitals and rehab clinics that totally saps one’s mental energy. I lost a few months of productivity. I figured that was why I was tired and slow. But: no. Enter HP Lumpcraft, also known as “the abomination formerly known as the right half of my thyroid.” The surgeon did a fine job. It looks like I won’t even need a zipper tat to cover up the scar. Theoretically, a slowly escalating thyroid debacle explains last year’s anemia. With HPL out, I’m feeling better than I have in a long time. Sadly, my cardio is utterly shot. I haven’t only been forbidden to exercise for the last few months, I’ve been forbidden to do anything that made me sweat. Apparently a “thyroid storm” could stop my heart. That sounded bad. I chose to become one with the recliner. FreeBSD Mastery: Jails was delayed by the aforementioned TBI and thyroid. It’s about half done. On a more upbeat note: SSH Mastery and Relayd and Httpd Mastery are available in hardcover. And to my surprise, you people are buying them. All future tech books and novels will appear in both hardcover and paperback. Winner Breaks All will be issued as a standalone in 2019, as soon as I get the rights back. When I get the rights back to SttH, it’ll go to my Patronizers but not to the general public. Giving SttH a cover that matches the Immortal Clay tales is prohibitively expensive, and short stories don’t make that much. Here’s a partial pic, minus Face Less and BSQ #4. I’ll post a true final 2018 pic once my copies of both arrive. I am assuming that the thyroid lobectomy fixed my root cause problem. It’s a hopeful assumption, yes, but I can’t plan based on the idea that my health is still mysteriously fubar. The only evidence I have for this is that my word-per-hour productivity more than twice what it was before surgery. That’s the only indicator that matters, right? First, I must exercise. A healthy writer is a productive writer. I gained a good twenty-five pounds this year, and blame HPL for every one of them. My double chin is his fault. Losing weight is straightforward: eat well, and exercise. The latter is where I’ve fallen down. I’m working back up to an hour of forms first thing in the morning, five days a week, plus 2-3 nights at the dojo. I started today with ten minutes, and plan to add a minute a day. Yes, that’ll stagger back and forth as my body demands. I turn 52 this year, I can’t charge full speed ahead any more. My flexibility is gone. You are as young as you are flexible, and my physical inability to kick people in the head really wounds my soul. After each bout of exercise I’m spending fifteen minutes on the stretching machine. For the record, this morning I hit 49″ between my ankles, or not even a right angle. This measurement is personal to me and this particular stretching machine, but the only person I’m competing with is me, so it’s all good. I still have the standing desk. I’ve been using a stool most of the time since September, but standing full-time is the goal. The last health goal is to master a split keyboard. Should make my shoulders happier. The Kinesis Advantage2 made my wrists happy, but rather than the Kinesis split keyboard I decided to try a Keyboard.io because the connector cable is a standard cat5. The Kinesis split keyboard has a built-in cable that maxes out at twenty inches, which is too limiting for my eventual use plan. (As I work at a standing desk, I’m pondering strapping a keyboard to each thigh and truly relaxing as I write.) I’m already pretty well adapted to the keyboardio, except for the all-important arrow keys. My most frequent key combination, CTRL-SHIFT-arrow, is kind of annoying on this critter. I’m breaking up my word goals a little differently this year. Last year I wanted to write 600,000 words. This year, I want to write 50,000 words a month, or… 600,000 words in the year. Only words meant for inclusion in books and magazines count towards the 50kwpm goal. This blog post doesn’t. Book announcements don’t. What books will those 50,000 words per month be? FreeBSD Mastery: Jails for sure. Probably second editions of N4SA and Sudo Mastery, because of stupid publishing industry reasons. But I honestly have new content for both, so that’s okay. Finish novels I started, like git sync murder and Terrapin Sky Tango. Amazon can deliver and NSP has copies, so I think I can say: Absolute FreeBSD is now shipping! Here’s the Obligatory Gratuitous New Book Selfie. Or check the book page for links to other stores. On 24 September 1993, the IETF published RFC 1519, designating Classless Interdomain Routing (CIDR) and variable length subnet masks as the standard. That particular document is obsoleted by later RFCs, but it’s still a milestone. Before then, IP addresses were allocated by “classes.” Class A, B, and C addresses were the norm. I’m not going to explain classful addressing, because it’s long obsolete and, on the current Internet, stupid. What I am going to do is go on a mini-tirade about classful addressing. Because there’s a lot of people out there still teaching classful addressing to newcomers. And then these poor newcomers hit the field, and people like me have to spend our time unteaching them what they so painfully learned. I fully understand it takes a few years to disseminate knowledge. But textbooks are still being published that claim classful routing is the standard. This is an appalling disservice to the profession. Yes, CIDR looks hard. But if a new network admin can’t handle CIDR and VLSM, they shouldn’t be administering networks. That’s perhaps the easiest math they’ll need to handle in their career. And the Internet is full of cheat sheets for people who don’t want to bother to do the math. On this, the 25th anniversary of Classless Inter-Domain Routing, I hereby declare 24 September 1993 CIDRDay, dedicated to stamping out classful addressing. A whole variety of celebrations are appropriate. First, of course: cider! Cider is obligatory on CIDRDay. Second, whenever someone who should know better says “Class C,” “Class B,” or “Class A” address? Explain to them the error of their ways, with the minimum amount of force needed to make sure that they never say it again. If you know someone who’s still teaching that garbage? Yell at them until they promise to stop. If yelling doesn’t work, escalate. Because frankly, I’m tired of reeducating innocent newcomers who should have been better served by their instructors. 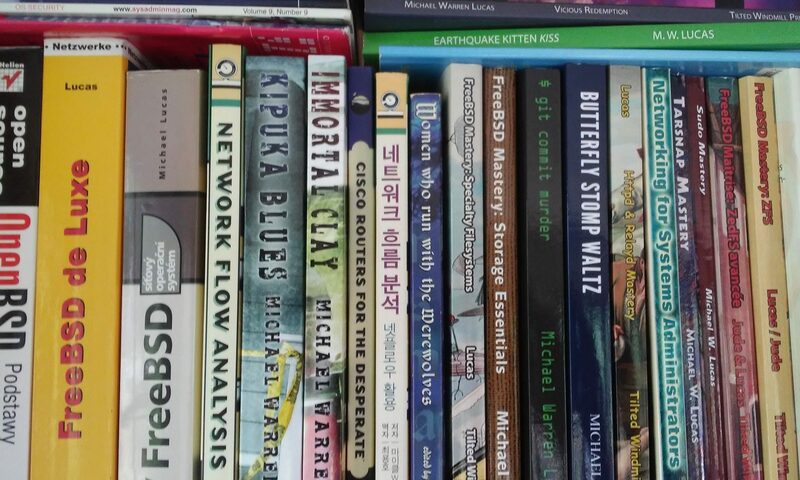 On 24 September, at 7 PM, I’ll be talking about migrating books from CreateSpace to KDP Print, including procedural, technical, and business aspects thereof, at the Grey Wolfe Scriptorium. “Talk” is a strong word here; we’ll have a couple remarks and then a back and forth discussion. I won’t say I know everything there is on this topic, but I’ve been following it closely. The hard parts of my migration are done, and I should be ninety percent finished by then. We all know that’ll leave me with only ninety percent of the work left to do. Apparently August 2018 is Shamelessly Shill Yourself Month. I appeared on the IT in the D podcast last week. A fun time was had by all–well, at least by me. And that’s the important thing, right? We talked about my books, decades of IT, SSH, ed, and general nerdery. I worked with Dave and Bob almost twenty years ago. Somehow they’d forgot just how painful it was to work with me and invited me on the show. And if you think I’m being self-deprecating there: the Michael Lucas Oversight Committee was an integral part of the company. Some of you require managerial oversight: I need a freaking team. Really, it’s best I’m self-employed. I’m clearly not fit for civilized company. Meanwhile, Bob and Dave went on to try to improve things for technology folks in Detroit. It’s like they’re better human beings than I am or something. Burn it down! Burn it all down! I burned yesterday and redesigned my web sites. What was www.michaelwlucas.com, blather.michaelwlucas.com, www.michaelwarrenlucas.com, and mwl.io have been consolidated in a single site, mwl.io. Fiction, nonfiction, FAQ, and blog, all coexisting as one happy family. Happy families are the ones most likely to stab each other in their sleep. But anyway. I have a whole slew of redirects on the old sites, so my incoming links should work. My Tiny RSS reader even caught my test post, so I’m pretty sure blog subscribers will continue to get my posts. Spending a couple days working on this mess wasn’t fun but maintaining four sites, the correlated interdependencies, and all the trivial little difference was eating up too much time. I’ll make back this time in a year. I also took the chance to fine-tune my web server’s TLS configuration, as 2012’s iffy algorithms are downright dubious today. Also, I’d like to thank Let’s Encrypt for making TLS everywhere a reality. This integration would never have happened without an infinite supply of web site certificates. If you’re not using them, you should. If you want to comment on the auction without making a bid, you can make those comments on this post. I have the first official batch of PAM Mastery print copies. Here’s the stack ready for the sponsors. Why is one box bigger than the others? One sponsor, who shall remain nameless but let’s call him SJ, sponsored the book several times over. Sending him more than one book seems like the right thing to do. Even if he doesn’t enjoy the books or their topics, they make great table levelers and spider smashers.